Of the many facts we all know about America’s Founding Fathers, at least one of them is wrong: George Washington did not have wooden teeth. His dentures were actually made of ivory, but because of all the port wine Washington drank, they got so stained that they looked like wood. If you care to see them, they’re on display in the National Museum of Dentistry in downtown Baltimore. Oh, and one other teeth-related note about the Founding Fathers: Beginning in 1768, Paul Revere advertised his services as a dentist. He did not, so far as we know, work on George Washington. Dentistry as a profession didn’t really catch on until the 19th century. From the 1100s until the 1700s, dental procedures — extractions mostly, but the occasional filling — were performed by barbers. 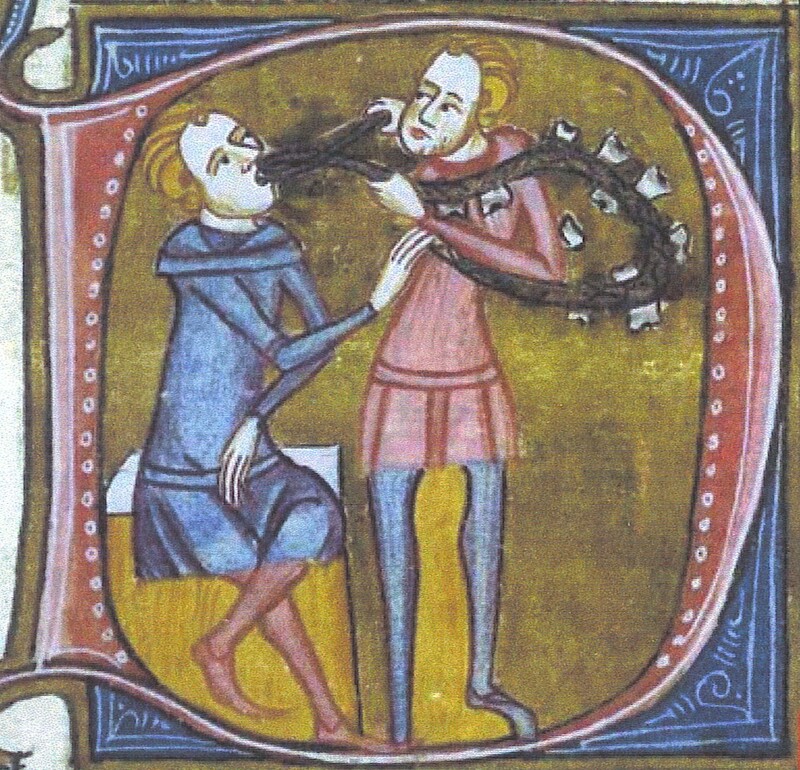 Prior to that, monks had done it, and prior to monks, dental work was pretty much do-it-yourself. Which is not to say that no one cared about oral hygiene. Various methods had been employed to keep teeth clean and breath tolerable at least as far back as ancient Greek and Roman times. The Chinese were using twigs to clean their teeth around 1600 B.C. The twigs were selected from aromatic trees; one end of the twig was chewed until it softened up and became sort of brush-like. In western cultures, a version of the chewstick was also used, and teeth were wiped off with cloth scraps for that minty-fresh feeling. It wasn’t until 1780 or so that toothbrushes were mass-produced. An Englishman named William Addis put his family to work assembling brushes that had handles carved out of bone. The bristles came from boars and were held in place by thin wires. I’d like to believe the barber gave you a free one if you didn’t cry when he yanked your molars. Perhaps the most important advancement in dentistry came along in the 1840s, when anesthesia began to be used. There is some dispute among dental historians about who deserves the credit for that achievement, but we can all be grateful that somebody figured it out. Frankly, I don’t think I’d see the dentist quite so often if the only thing they could do for potentially painful procedures was to tie me into the chair. As pointed out earlier, this was also the era when dentistry became the province of actual dentists, rather than just guys who gave haircuts and were also handy with tools. Today, dentistry is acknowledged as a medical specialty; oral-health professionals serve a vital function, and they do it skillfully (and relatively painlessly). In honor of their dedication, they even have their own patron saint, Apollonia. Her feast day is February 9, which also happens to be my wife’s birthday. Hey, that gives me a great idea for a present — a gift certificate for a visit to a dentist! What do you think? This entry was posted in History, Science and tagged dentistry, George Washington's dentures. Bookmark the permalink. Good thinking, Sweetheart. I would not consider a gift certificate to the dentist a “wow moment” (see previous post).